Perhaps it was the nearly two-hour bus ride from San Pedro that put the girls of Rolling Hills Prep into a long-range state of mind. Almost from the outset of their CIF State regional semifinal at Heritage Christian on Tuesday, the order of the night was long-range shooting. 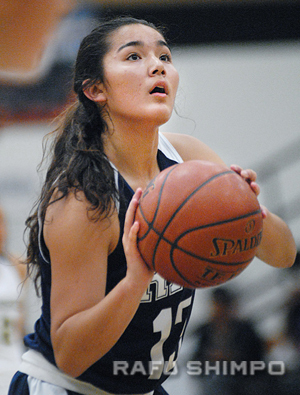 Within the first minute of play, Madison Yamada and Lauren Tsuji each connected on three-pointers, and the Huskies never looked back, dominating the game, 74-49, and earning a berth in Saturday’s Div. V SoCal regional championship on Saturday. Macy Pakele tied a game high with 21 points for the Huskies. Heritage Christian, the division’s top seed, never mounted a substantial challenge, as Rolling Hills Prep combined high-percentage shots with a crushing defense to lead wire to wire. The Huskies led by more than 20 points for most of the contest, stretching the lead to 30 for a short time in the fourth quarter. Seven RHP three-pointers in first half set the tone for what had been expected to be a tight game. RHP (31-3) has come out of relative nowhere, with a roster that features no seniors and six frosh players. Two of their first-year starters, Macy Pakele and Alyssa Maxey, led all scorers with 21 points each. Tsuji had 14 points, while Yamada added 11. After two seasons of barely making the playoffs, junior co-captain Tsuji couldn’t be happier about this pack of Huskies. Alyssa Maxey also scored 21 points for RHP. Head coach Richard Masson has built a solid team with a roster that doesn’t boast any dominating stars – on a campus that doesn’t have its own gymnasium – and he admitted that some of his girls are still in the early stages of gaining experience. Yamada added that Coach Masson stresses the psychological as much as the physical. “He teaches us that mental toughness is 90 percent of the game,” she said. Rolling Hills Prep, who captured the CIF Southern Section Div. 6 title, will play for a trip to the State Championship at Bellarmine-Jefferson on Saturday. Tip-off is set for 7 p.m.
Bell-Jeff advanced to the regional final at the expense of Crean Lutheran, battling to a 50-35 road win in Irvine. 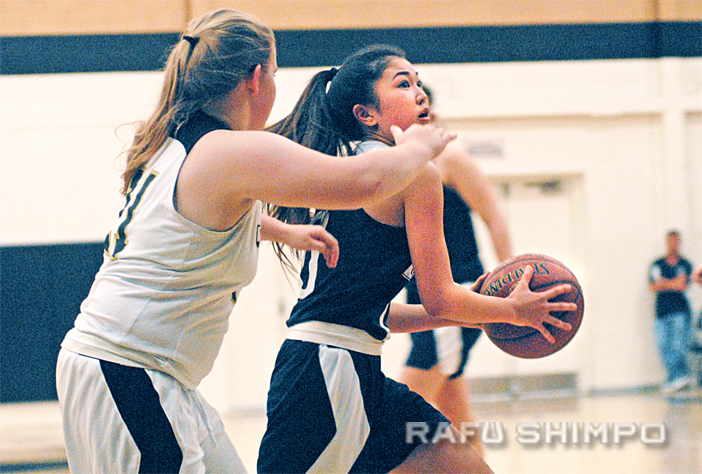 Erin Koyamatsu scored five points for the Saints, whose season ends with a record of 20-12. Village Christian will be playing for a SoCal title of their own, after the Crusdaers took care of visiting Sierra Pacific, 57-49. 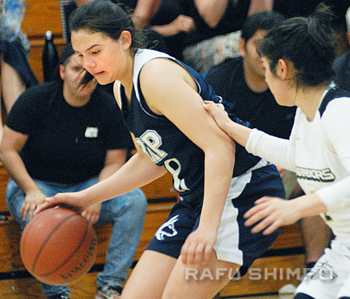 Micaela Cacho-Negrete had a game-high 21 points and Alysha Maile Yamada added 13 with three assists for Village Christian (31-3). Village Christian will host No. 1 Los Osos at 6 p.m. Saturday in the Div. IV regional championship. The boys of Rolling Hills Prep are also headed to the SoCal regional finals, after head coach Harvey Kitani’s squad got a buzzer-beating floater to fall and defeat Holy Martyrs, 40-39 on Tuesday. It was the 800th coaching win for Kitani, the former Fairfax High coach who said he drew up the final play to get the ball into the hands of Alex Garcia for the dramatic shot. The Huskies will travel to face top-seeded Notre Dame of Riverside in the Div. V SoCal regional final on Saturday. Game time is set for 6 p.m.